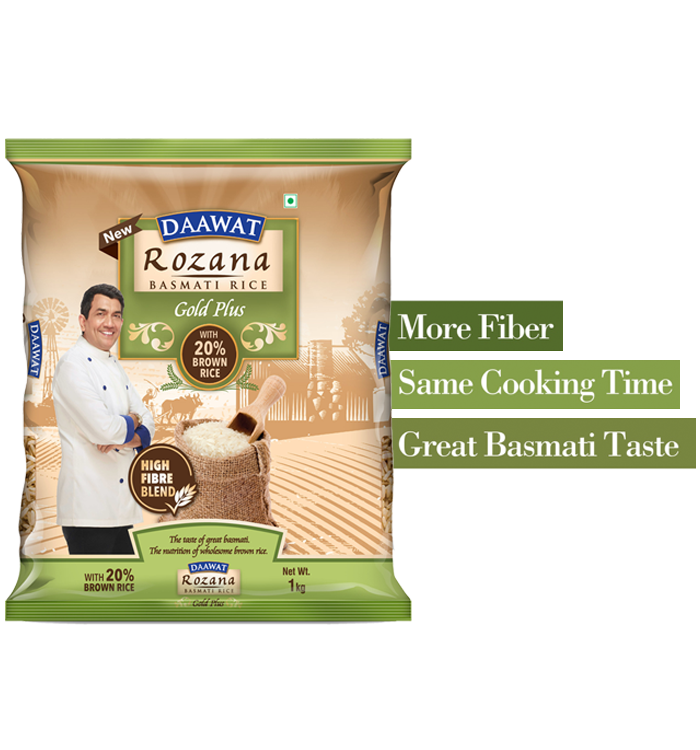 Introducing Daawat Rozana Gold Plus. The product is a unique blend of flavoursome white basmati + Fibre rich Brown Rice. Rozana Gold plus offers you the same great taste of aromatic and flavoursome basmati rice with the added goodness of healthy fibre in one pack. Daawat Rozana Super is the finest Basmati Rice in the mid-price affordable segment. It is specially processed for daily cooking across a multitude of regular dishes, a perfect fit for every day consumption. Rozana Super promises a sweet taste and rich aroma as each grain is naturally aged. Daawat Rozana Gini 70 is pure basmati which comes from our premium 'Specialist' range for its smaller size. It has all the magnificent qualities of pure basmati uniformly graded by our aromatic sortex machines into different sizes & rozana brands, which you may buy as per your rice preparation. Once a luxury enjoyed only by royalty, the queen of rice can now grace your dining table every day. Rozana short length basmati promises the authentic taste and fragrance of basmati harvested from the finest seeds, at a price that fits into every budget! Daawat Rozana Mini 60 is pure basmati which comes from our premium 'Specialist' range for its smaller size. It has all the magnificent qualities of pure basmati uniformly graded by our aromatic sortex machines into different sizes & rozana brands, which you may buy as per your rice preparation. Once a luxury enjoyed only by royalty, the queen of rice can now grace your dining table every day. Rozana short length basmati promises the authentic taste and fragrance of basmati harvested from the finest seeds, at a price that fits into every budget! Daawat Rozana Tini 50 is pure basmati which comes from our premium 'Specialist' range for its smaller size. It has all the magnificent qualities of pure basmati uniformly graded by our aromatic sortex machines into different sizes & rozana brands, which you may buy as per your rice preparation. Once a luxury enjoyed only by royalty, the queen of rice can now grace your dining table every day. Rozana short length basmati promises the authentic taste and fragrance of basmati harvested from the finest seeds, at a price that fits into every budget! Daawat Rozana Niki 40 is pure basmati which comes from our premium 'Specialist' range for its smaller size. It has all the magnificent qualities of pure basmati uniformly graded by our aromatic sortex machines into different sizes & rozana brands, which you may buy as per your rice preparation. Once a luxury enjoyed only by royalty, the queen of rice can now grace your dining table every day. Rozana short length basmati promises the authentic taste and fragrance of basmati harvested from the finest seeds, at a price that fits into every budget!